A parliamentary report of 1777 recorded a parish workhouse in operation at Alverstoke for up to 200 inmates. Alverstoke, which included Gosport, was incorporated in 1799 under Gilbert's Act of 1782 which allowed parishes to set up workhouses for the elderly and infirm and children. It was decided that the town's existing poorhouse on South Street should be replaced by a new "House of Industry" on land at the south side of Alver Creek (later known as Workhouse Lake). The ten acre site was on the Ewer Common lands administered by the Bishop of Winchester. In December 1799, advertisements were placed for plans and estimates for a poorhouse to accommodate 250 paupers. The successful bidder appears to have been Mr Francis Carter and the new workhouse was opened in 1801. The design is one of the earliest examples of a building with a supervisory hub from which the Master could easily observe the inmates in every direction. An 1829 plan of the building shows the T-shaped main building surrounded by a number of separate blocks containing men's and women's infirmaries, lunatic cells and workshops. The inmates spun yarn for stockings, linen for aprons and gowns, and wool for coats and rugs. These products were transported by boat to a market at Portsmouth Harbour. Because of its status as a Gilbert Act Parish, Alverstoke fell outside most of the provisions of the 1834 Poor Law Amendment Act. However, in 1852 the parish was persuaded to adopt Poor Law Parish status under the 1834 Act. The Alverstoke workhouse's location and layout are shown on the 1910 map below. By this date, many additions had been made to the building including a two-storey entrance block at the north. One of the workhouse's former inmates, a ten year pauper called John Valentine Gray, was murdered by his employer, a chimney sweep called Benjamin Davies from Newport, Isle of Wight. The death of the tiny and undernourished boy is said to have inspired Charles Kingsley's 1863 book The Water Babies . Alverstoke workhouse site from the north, 1920s. 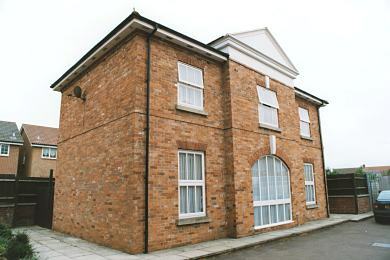 The workhouse, which later became Alverstoke Public Assistance Institution, finally closed after the Second World War. It was occupied as an industrial unit until its demolition in 1989. The site has now been redeveloped for residential use. Although it was intended to preserve the former gatehouse, it was deemed to be in too poor a condition. In it place, a replica of the original building was constructed. Alverstoke replica gatehouse from the north-east, 2001. Hampshire Record Office, Sussex Street, Winchester SO23 8TH. Few records survive. Holdings include Guardians' minute books (1799-1831, 1852-1930); Ledgers (1861-6,1920-7); Committee minutes (1910-30).